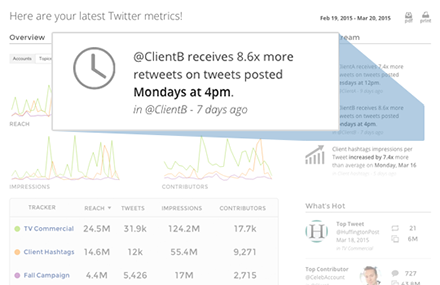 TweetReach snapshot reports are powered by Union Metrics. Union Metrics is more than free TweetReach snapshot reports! We've upgraded TweetReach Pro and it's now part of Union Metrics subscriptions. Monitor all the topics and profiles important to you on Twitter, Instagram and Facebook. 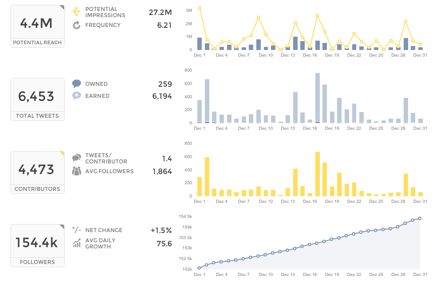 Improve your social media strategy and execution across social media with Union Metrics. Our social media analytics are easy to set up, use and share with all your relevant stakeholders. Never miss a post again. Our analytics are built on full-fidelity, commercial access to social data. Our analytics work in real time to deliver timely insights you can use to make better decisions. Our no-hassle subscriptions start at just $99 per month for ongoing analytics of two profiles or topics. "Union Metrics is an important strategic tool for Intrapromote. With comprehensive analytics that allow us to measure reach, exposure and contributors, we can capture and report the full impact of our social media campaigns." Union Metrics subscriptions provide in-depth analytics on social posts across Twitter, Instagram and Facebook, including reach, engagement, content performance, competitive analysis, and so much more. Monitor all the topics and profiles that matter to you. Starts at just $29 per month! 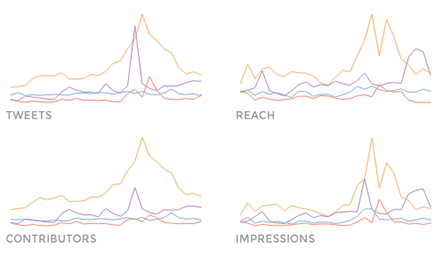 Find out how your posts performed across Twitter, Instagram and Facebook. Quickly figure out what's working, what isn't, and how you can improve to generate more engagement and get more followers. Understand the full conversation about your brand and events with full-text search. With our Trackers, you can set up monitoring for any hashtags, keywords, names, phrases - anything that appears on social media. With social media analytics from Union Metrics, you can analyze any social profile, not just yours. Monitor your competitors and measure share of voice to see how you compare. Subscribe to Union Metrics and start getting social insights immediately.